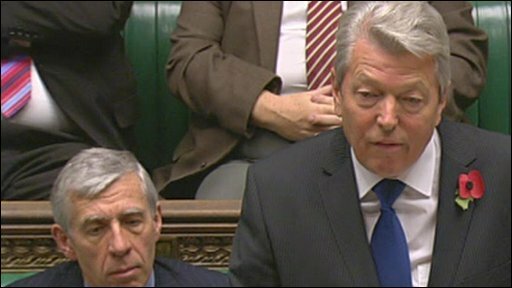 Alan Johnson: "His role (was) to advise rather than criticise government policy on drugs"
Colleagues of the government drugs adviser sacked by Alan Johnson say they have "serious concerns" about his decision and whether they can continue. Two drugs advisory panel members quit in protest when Prof David Nutt was fired for comments on cannabis policy. Others have questioned whether they can continue in "good conscience". The home secretary denied reports that there will be a review of the council's role and told MPs he would meet members to discuss the situation "shortly". Prof Nutt, chairman of the Advisory Council on the Misuse of Drugs, was sacked on Friday after using a lecture to say that cannabis was less harmful than alcohol and tobacco. He also said it had been upgraded from class C to class B - against the council's advice - for political reasons. Earlier in the year he suggested that taking ecstasy was no more dangerous than horse riding. In a statement to MPs, Mr Johnson said the reason for sacking Prof Nutt was not "the work of the council but because of his failure to recognise that... his role is to advise rather than criticise". He added that he had "lost confidence in the professor's ability to be my principal adviser on drugs". Mr Johnson said Prof Nutt had "acted in a way that undermined the government rather than supporting its work". But he added that the advisory council, set up in 1971, had been "invaluable to the successive governments it has served". The letter sent by the council to the home secretary says that, while not all remaining 28 members have been reached, "it is clear that a majority of the council have serious concerns" about Prof Nutt's dismissal and the body's future. It also says: "For some members these matters are of such seriousness as to raise the question whether they can, in good conscience, continue on the council. "In this situation members wish for clarity and assurances about how the ministers view the council's advice and will view the council's advice in the future." One member, Dr Les King, resigned on Sunday in protest at Prof Nutt's sacking. Another, pharmacist Marion Walker, has also resigned. Dr King told the BBC he did not think the panel could continue. He said ministers had used the council as "a rubber stamp, as a poodle, by coming to the advisory council with a pre-determined agenda about drug classification". The prime minister's spokesman said Mr Brown fully supported Mr Johnson but said Mr Brown had not been personally involved. For the Conservatives, shadow home secretary Chris Grayling said Mr Johnson's decision had been "the right one", as some of Prof Nutt's comments had been "particularly ill-judged", but criticised the "unseemly row". But Liberal Democrat spokesman Chris Huhne said Prof Nutt's comments had been "in no way contrary" to the code of practice for advisers.